The Fresh Music Page: Here’s the Top Five blog posts of 2010 based on traffic. Here’s the Top Five blog posts of 2010 based on traffic. 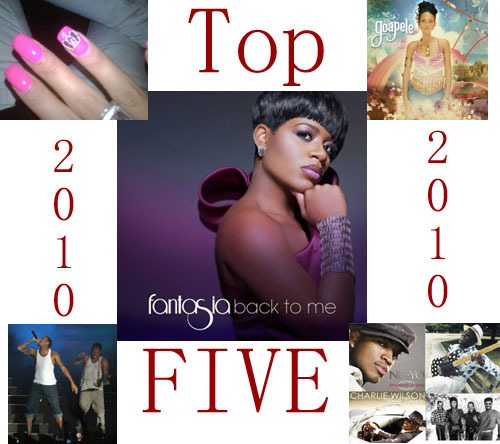 Here are the Top Five most popular blog posts on The Fresh Music Page of 2010! Interesting and unique list of people, events, and things. 1. Fantasia new album Preview! - A lot of people were interested in Fantasia’s newest album “Back To Me” which I feel is her best one to date. 2. Cassie accidentally touches Aretha’s Pink Cadillac. - The title makes me laugh but I’m surprise that this post is the second most visited post of 2010. It has very little to do with music but everything to do with Nail art. Maybe I should post more posts about nail art? 3. Chris Brown joins Usher and His Wet Pants on Stage in Jamaica - I think most people wanted to see the picture of both Chris Brown and Usher. However, you wouldn’t believe the amount of people that searched the terms “Wet Pants”. Interesting indeed. 4. Taste of Chicago - Music Schedule - This was a popular post for spammers before I developed a way to block the spam. What’s really weird is that it’s the Taste of Chicago Music Schedule from 2009! Performers included: Ne-Yo, Keri Hilson, Buddy Guy, Charlie Wilson, and Cameo. 5. Artists that will help you relax because it’s Friday - This is one of my favorite posts and I’ll be doing a part 2 very soon. Especially since this list is from 2009. I’m happy people really lost lists because I enjoy making them. What have I learned from these top 5 posts? Fantasia is popular, interesting titles drive traffic, people want to see wet pants, spammers are attracted to the weirdest posts, and lists, people love lists! Thumbs up! Happy new year, D! Happy New Year to you too Kizzy!